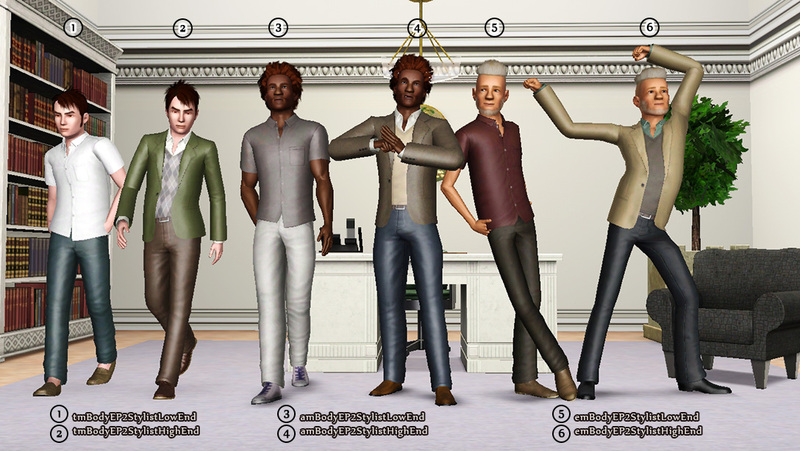 While trawling through the game's files in search for various things, I discovered the Stylist outfits from Ambitions. And whaddya know, they're nice enough to wear as regular clothes, not just as Career outfits! And I didn't even know teens can become Stylists, but apparently EA made uniforms for them too. The Low-End male outfits are edited. Specifically, I decided to go ahead and remove those annoying scissors - they're absolutely useless and ugly even for the career uniform. So I spent a few hours learning how to extract the DDS resources and edit them. The biggest hurdle was getting the transparency to work, which meant re-enabling the alpha channel before saving them. In one case I had to create one and cut out the appropriate pieces, since the image was missing that channel. This texture edit applies only to the male outfits (teen-elder), since the female ones don't have accessories attached to them. This is also the reason why those files are bigger than the female outfit ones; I had to include the appropriate edited textures. I can upload the non-edited (default replacement) version of these outfits too, if anyone wants them. Alternatively, anyone can simply open them in S3PE and delete all the _IMG resources. All Stylist outfits are visible in CAS now. All outfits are enabled for Everyday, Formal, Career, Makeover, and Random. Enabled for Outerwear: Low-End outfit for TF, AF, EF ; High-End outfit for TM, AM, EM. NOT enabled for Outerwear: High-End outfit for TF, AF, EF ; Low-End outfit for TM, AM, EM. 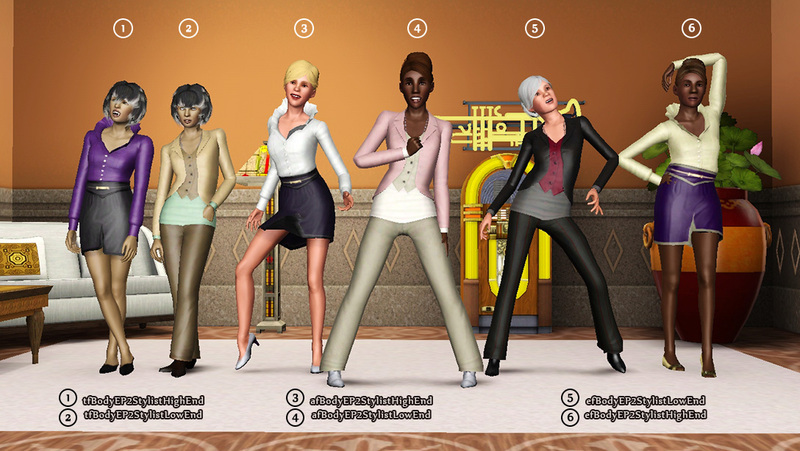 The High-End and Low-End Stylist outfits, for Teen-Elder, males and females. The group screenshots you see above. The cuts are exactly the same for each age group, except modeled to fit those body meshes and with other color variations. I did not include any custom ones; it's what EA provided. I decided to ditch the individual previews because the archive was getting too big for simple stuff like this. Creators of S3OC and S3PE.